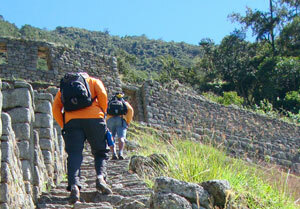 This variation on the Traditional Camino Inca Trail is for people who want to take a more leisurely trek to Machu Picchu. It is the most popular and well known route among tourists. The whole trail is about 50 km, and takes about 5 days to complete. This includes a day visiting the Machu Picchu Archeological Center. This trail provides some of the most impressive views of snow capped peaks, flora and fauna, that are all unique to this marvelous area. DAY 1: Cusco / Chillca / llaqtapata. of in the heights. It is located at 2,700-2,950 M.A.S.L. DAY 2: LLaqtapata / LLulluchampa. After a nutritional breakfast we start down the trail to navigate the Cusichaca Ravine, where we will pass by the towns of Tarachayoc and Hatunchaka. The path we will take passes through the Wayllabamba Community. This is where we will encounter the small archeological site, which may have served as a control point during the Incan times. The name Wayllabamba means, “green meadows” In Quechua. This is a small town that can trace its ancesestry to the Incan times. This is the last town in the network of the Inca Trail. After wayllabamba we will head to Ayapata also known as Three Stones. Here we will eat lunch. After a merciful break we will continue our ascent to Llulluchapampa (2,950 ; 3,700 M.A.S.L. ), where we will spend the night.. The days hike will be between 5 and 6 hours. DAY 3: Llulluchapammpa / Phuyupatamarca. On the third day we will get up very early. This will be another difficult day, but not impossible. After breakfast we will head towards the highest point of our trail, The Warmiwañusca Pass (4,200 M.A.S.L.). We will reach the pass in 1 and half hours from when we wake up. After a moment of rest we will begin the descent to the valley Pacaymayu, which means, “Hidden River” (3,650 M.A.S.L.). The river, which we will see when we reach the lower part of the Inca trail, goes by the name Pacaymayu as well. Along the river we will see amazing waterfalls and the ascent we will soon follow. We will rest along the river before towards the next pass. Along our ascent we sill stop at the archeological site of Runkurakay (3,950 M.A.S.L.). It is approximately a 45 minute hike. Throughout the day you will be able to see the Urubamba Valley. From the second pass we the Aobamba Valley, and the Vilcambamba mountain range. Finally we will descend to Chakicocha, although depending on the trekkers physical condition we can continue to Phuyupatamarca to spend the night. DAY 4: Phuyupatamarca /Aguas Calientes. 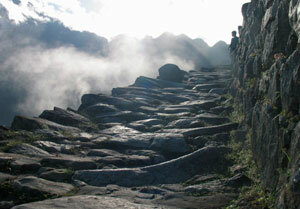 This easy day we will descend 3 hours to Wiñaywaya Ruins (2,700 M.A.S.L. ), a small Incan city with a large amount of fountains and spectacular passages. Here we will have lunch and a rest. After we have regained our strength we head out to the northeast to Inti Punku (Door Of the Sun.). From this point we will have a beautiful of Machu Picchu. From there we take the final leg of the journey to the ancient city of Machu Picchu. After a long journey we take a bus to Aguas Calietes where we spend the night in a hostal with private bathroom,hot shower,towel. DAY 5: Aguas Calientes Machu Picchu / Cusco. For the final day, after a long rest in the hotel we will leave early for the hot springs of Aguas Calientes. We will eat breakfast and and cotinue aboard a bus for Machu Picchu. 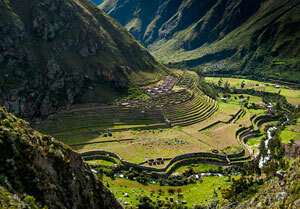 In the Incan citadel we will have a two hour guided tour to take in the marvel of the ancient city. You will be amazed by the most outstanding achievement of engineering in all the ancient cultures of the Americas. The temples, the stairs, the facades, and palaces of stone dispersed throughout show the energy and the genius of the constructions, and their engineers. After the tour you will have free time to walk around the mysterious city. In the afternoon we will return to the city of Cusco.